My New Summer Wine? Pecorino! The warm weather is already here in Florida. Yes … already! Along with warming weather comes the dwindling days and nights remaining to enjoy sitting on my deck at home with a glass of wine. Warm temperatures also mean starting the search for some fun and different white wines to enjoy along with the deck’s view! So I headed to my favorite wine store to see what they had. I found a bunch and I cracked one open the other night for dinner. I couldn’t have been happier with my choice. Pecorino is a white grape variety from Italy. 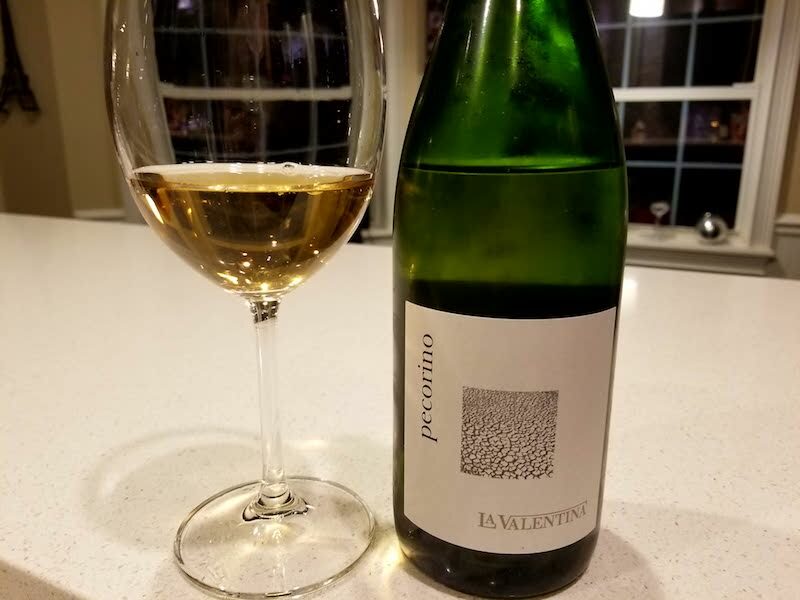 Grown for hundreds of year in the Marche region, it was slowly replaced by more “productive” grapes, particularly Trebbiano. Rediscovered in the 1980s, Pecorino has made a comeback and is producing some lovely wines. 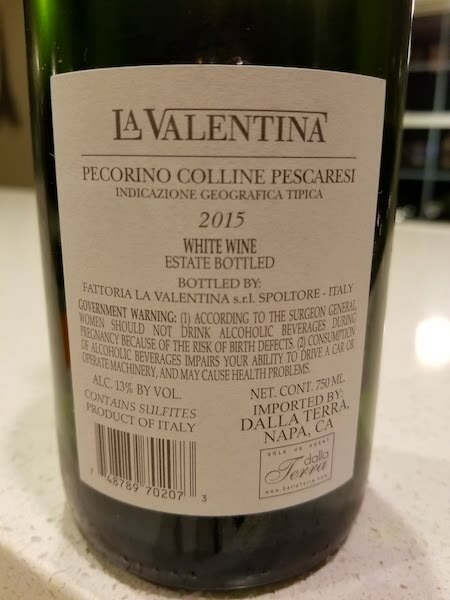 From Abruzzo’s subregion Colline Pescaresi, the 2015 La Valentina Pecorino is very aromatic with white flowers, pineapple and Meyer lemon on the nose. On the palate is exotic rich fruit, but with such great acidity, the richness is not at all overbearing. The palate also has some green apple, lemon, great minerality and an oily texture. Plus, the light golden color makes it look very pretty in the glass! This wine sees no oak, and the richness is undoubtedly due in part to sur-lie aging, as well as some skin contact before fermentation. 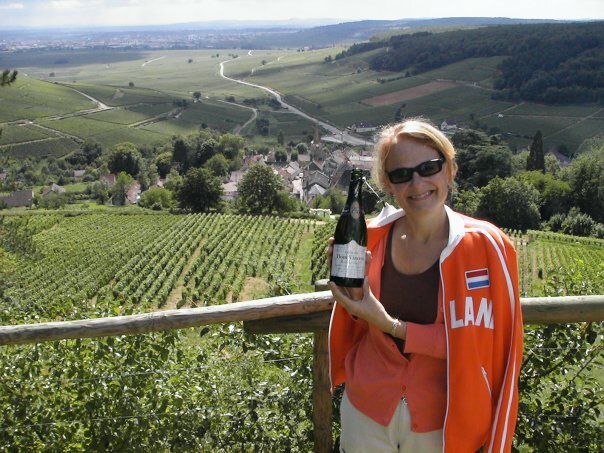 What’s not to like about a full-bodied complex white wine with great acidity that makes you keep wanting another glass? For dinner, I had made a white pizza with roasted cauliflower and spinach. 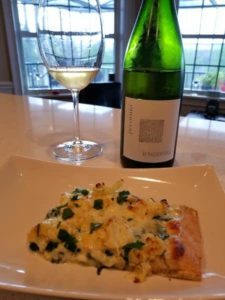 The acidity of the wine cut beautifully through the richness of the Béchamel sauce on the pizza. The fruitiness of the wine complimented the mozzarella and the vegetables. The pairing was a success! 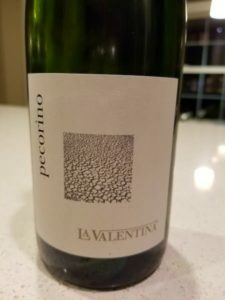 If you want to change up your white wine world, and perhaps are looking for something other than a Sauvignon Blanc, check out Pecorino. In fact, why not try the La Valentina Pecorino. I can attest to it being a really nice wine, and at below $20, it’s also a great bang for the buck.